Valve is revising how it calculates user Review Scores on Steam again. In recent years, review bombing has become something of the norm. Games like Firewatch, PlayerUnknown's Battlegrounds, Metro: Last Light, and more have dealt with the phenomenon. Though the anger each inspired is markedly different (Metro's, for instance, was on the news that Metro Exodus would be an Epic Games Store exclusive; other review bombing instances have happened over DRM), the result is always the same: users leaving negative reviews en masse, to drive the overall consensus downwards. It's been a problem with Steam for a long time, and today, Valve is taking steps to address it. On a blog post, Valve has said with feedback and data on hand of the review bombing epidemic, it will start "to identify off-topic review bombs, and remove them from the Review Score." To do this, Valve built a tool internally that will track a game's user review activity, and mark the time period a review bomb occurs and contact the developer. The reviews during the marked time period will be removed from calculations of the Review Score seen near the top of a game's Steam page. "The reviews themselves are left untouched," the blog continues, "if you want to dig into them to see if they're relevant to you, you'll still be able to do so. To help you do that, we've made it clear when you're looking at a store page where we've removed some reviews by default, and we've further improved the UI around anomalous review periods." Recently with the review bombing of the Taiwanese horror game Devotion, which spiralled into it leaving Steam entirely, many users also tried to combat the negative reviews with positive ones. In a Q&A at the bottom of the blog, Valve clarifies that during a review bombing catch all period, no reviews will be counted towards the final Review Score. So for those valiant positive reviewers out there who try to combat all the negativity: hold onto your review for a later date if you want it to be "counted." 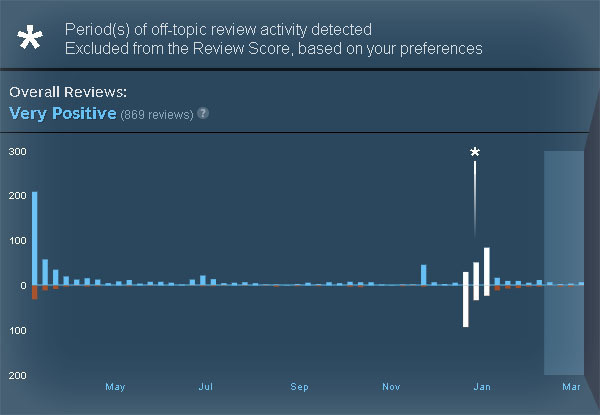 The last time Valve refreshed its user reviews system was when Firewatch was review bombed in 2017, where it rolled out a new ratio showing customers how many positive to negative reviews there were. Evidenced by the past year-plus since it rolled out, it hasn't fixed much. Perhaps with this new change though, Valve is taking a step in the right direction. Tagged with Macs,	News,	PC,	Steam,	Valve Software.